Investor’s Business Daily recently posted an editorial about the impact of President Trump’s proposed tax cuts. The editorial notes that the Democrats sudden concern for deficits is a bit disingenuous after the impact President Obama had on the deficit during the past eight years. The editorial also notes that President Trump’s tax plan will not increase the deficit, but will probably decrease the deficit due to the economic growth created by lowering taxes. According to the Congressional Budget Office, the House tax bill would boost deficits over the next 10 years by a total of $1.4 trillion. The added interest on the debt would kick that up to $1.7 trillion. That looks like a lot of money. Except that equals just a 17% increase in total deficits projected over the next decade. And that increase is a wild exaggeration, since it doesn’t allow for any extra economic growth from the GOP‘s pro-growth tax cuts — a premise that even some honest liberal economists don’t believe. The actual deficit boost, if there is any, will be far smaller than what the CBO says. But let’s accept the CBO’s numbers as gospel truth. Look more closely at the data and you see that what’s driving deficits ever upward isn’t the Republican tax cuts. It is out-of-control spending. Over the past 50 years, despite all the myriad changes in tax laws, revenues as a share of GDP have remained remarkably close to the average: 17.4%. In fiscal year 2017, which ended in September, the share was 17.3%. In Bush’s last in office, it was 17.1%. When Bill Clinton took office in 1991, it was 17.3%. What happens if the Republican tax plan goes into effect? According to the CBO, taxes as a share of the economy in 2027 will be … 17.9%. That’s right. Even with an allegedly budget-busting tax cut, the federal government will claim a greater share of the nation’s economy in 2027 than it does today, and that share will be above the average for the previous 50 years. 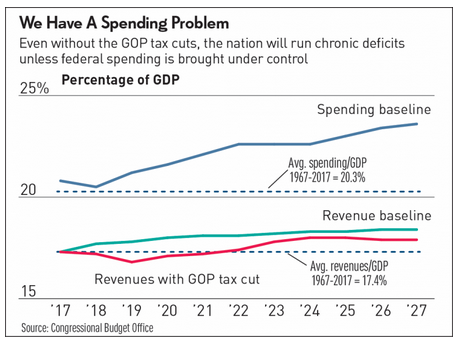 The only reason deficits continue to climb over the next decade is because federal spending is going up at an unsustainable rate. But the bigger problem is that any reasonable attempt to rein in any of the entitlement programs is met by fierce and unrelenting opposition from all those Democrats who now claim to worry about deficits. They will viciously demagogue any Republican who dares to propose real reforms of these programs, and then brag about any resulting election victories. So, the next time you hear Democrats pretend to be deficit hawks, ask them what their plan is to bring entitlement spending under control. This entry was posted in Uncategorized and tagged Barack Obama, Donald Trump, Economic growth, Gross domestic product, Republican Party (United States), Tax cut, United States by granny g. Bookmark the permalink.